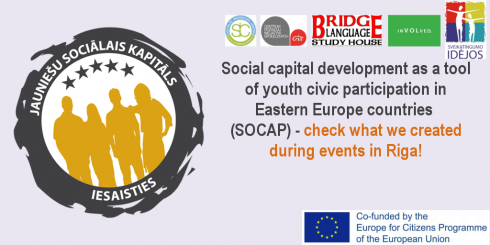 Project “Promotion of key competences of youth by coworking concept approach in youth centres” was started one year ago and a lot of work has been done to research various aspects as well as the best cases of incorporation of coworking spaces in youth centres in several European countries. The main purpose of report “The promotion of youth key competences by a coworking concept approach in youth centres” is to present guidelines for youth centres which can stimulate young people, start-ups and other stakeholders form Latvia, Estonia, Italy and Spain to provide more entrepreneurial and personal development possibilities for youth. Moreover, the goal of the project is to generate new possibilities, learning and experience that will guide the future improvement of a coworking concept in various European countries. This report provides an elaborate insight in the situation within all partner countries by providing overview regarding functions of youth centres, the role of coworking spaces, possibilities of rural coworking as well as the successful examples of incorporation of the coworking concept within youth centres in Latvia, Estonia, Italy and Spain. The guidelines are concluded with recommendation for youth centres to make a successful implementation of the coworking concept, taking into consideration various aspects, such as design and functionality of the space as well as social, economic, educational aspects and successful community building.